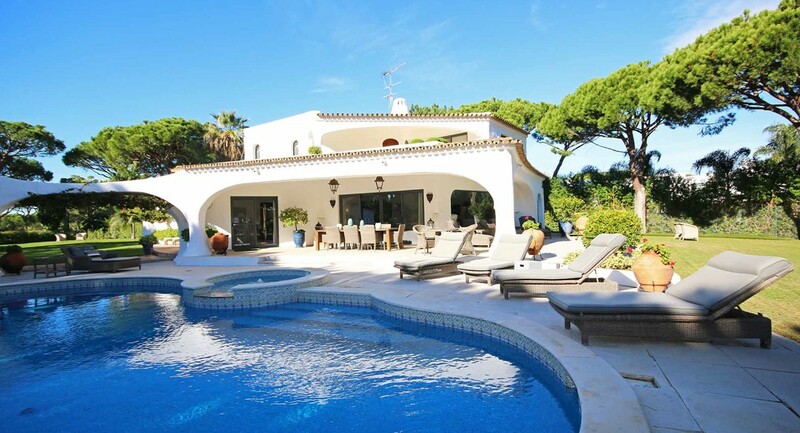 Azure Holidays are thrilled to present this stunning and unique 6 bed villa with a private pool in Quinta do Lago. 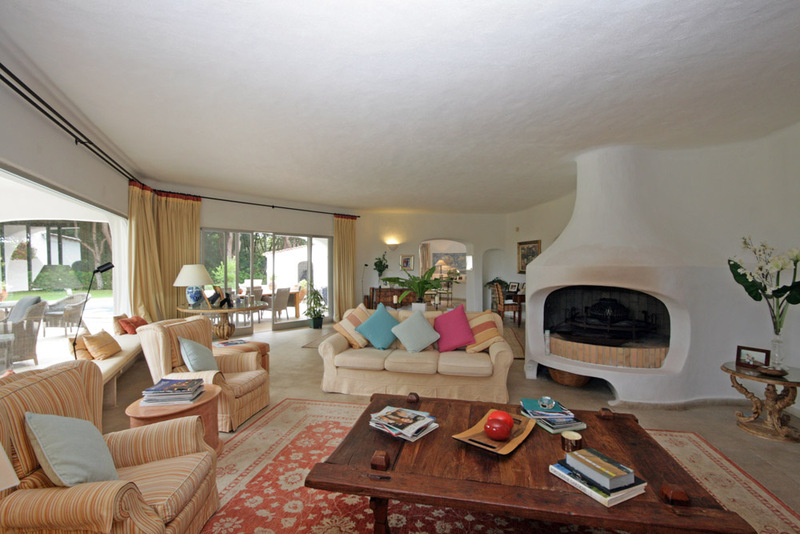 This luxury villa is right on the golf course and is therefore the perfect villa for a golf holiday. 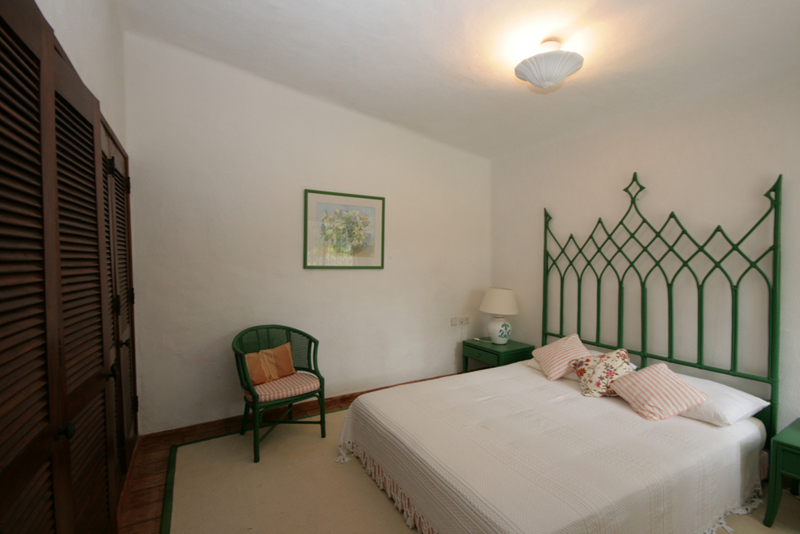 It is also a wonderful family villa offering an exciting adventure around every corner. Ask Azure "We love the design of this villa, a cross between traditional Moorish and luxury space-age, this is the kind of villa that reminds us of a futuristic style house from a programme like the Jestons. The curved walls and rounded features of this villa are exciting and give a very luxurious and thrilling feel to the whole property. We love the space here; there is so much of this property to enjoy." You arrive at this property through secure electronic gates, and the first thing you notice is the stunning white villa before you. Accessed down a cobbled path ending at the front door your eye is drawn to the first of many curved archways. 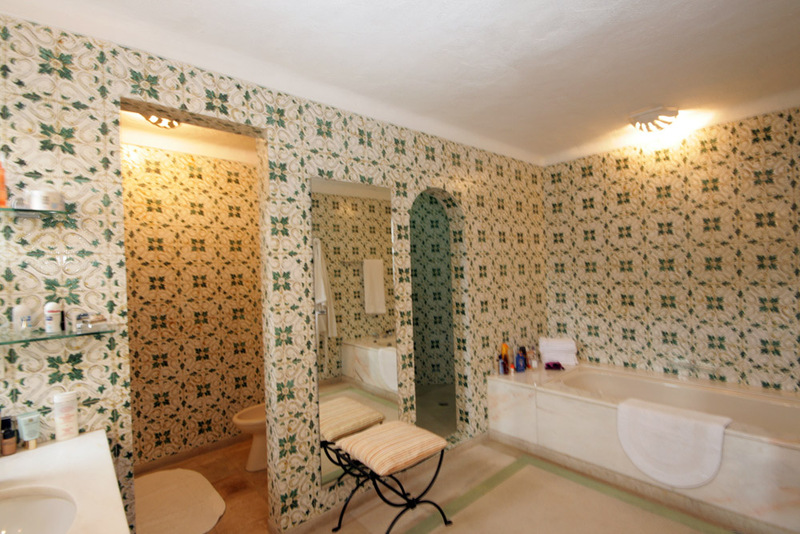 It's these elegant and smooth walls that really give this villa its unique and special qualities. Perhaps the second thing you notice is just how much space surrounds this property. 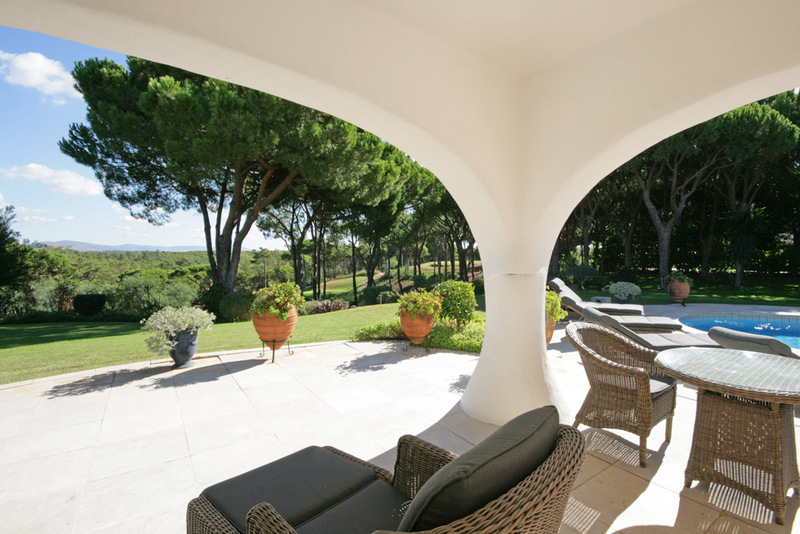 The villa itself is right in the middle of a large plot that is completely surrounded by mature trees. 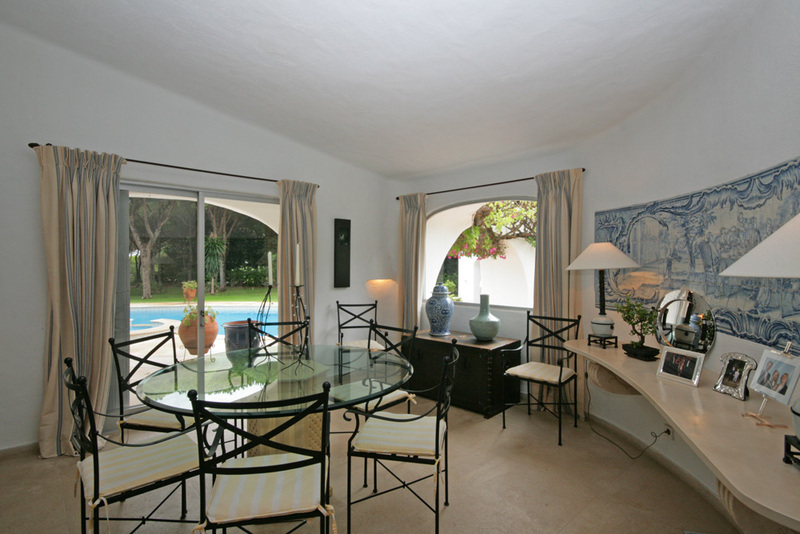 The seclusion and privacy of this villa is complemented by its peace and quiet, this is the ideal getaway location. At the front of the property there is lots of green lawned areas, perfect for picnicking. At the rear of the property the fun really begins. The most obvious draw is the fantastic large pool and Jacuzzi. This pool is in a bean shape and at the front centre is a separate Jacuzzi for you to enjoy. This wonderful part of the garden offers the perfect spot for relaxation and fun. Surrounding the pool are some luxurious sun loungers in ideal for making the most of the Portuguese sunshine. 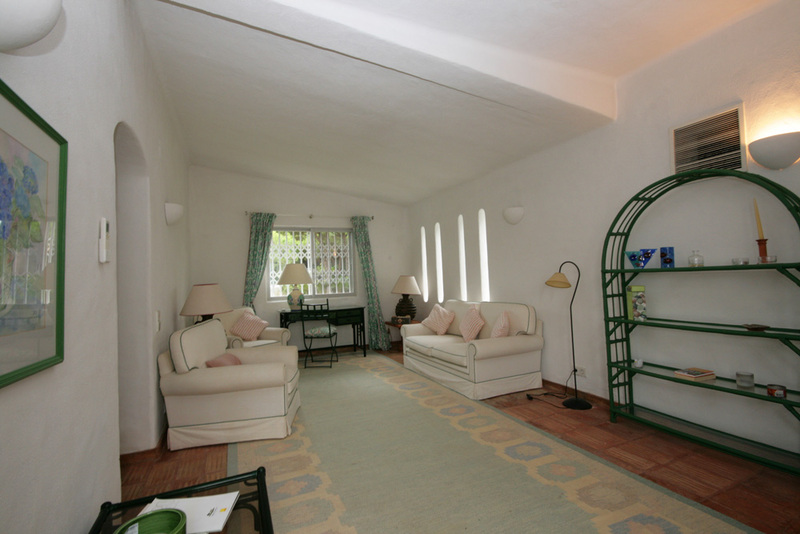 Underneath the cover of one of the rear archways you will find many other areas to sit and relax. A large dining table and comfortable rattan furniture, invites alfresco dining in style. Another area has yet more rattan items that seem to call you to sit and relax with a good book. Around a corner you will see another terrace area, with garden sofas where you can take a siesta or just enjoy the view. 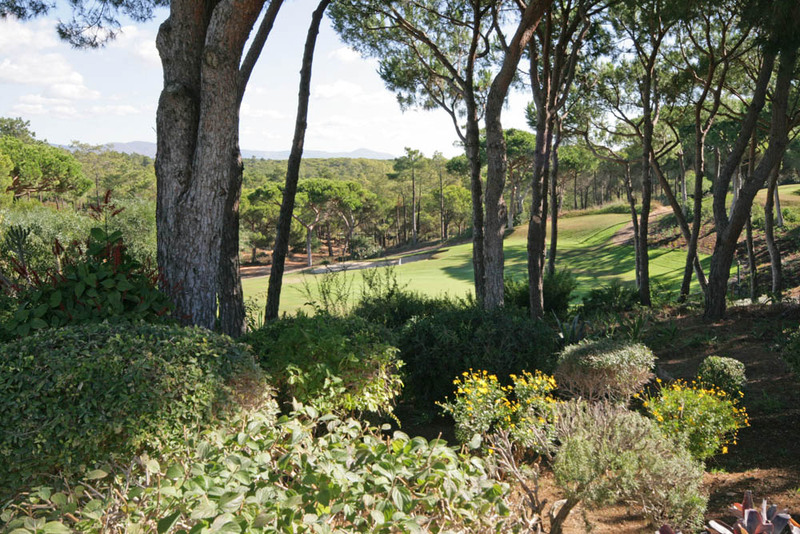 The villa looks out over the Quinta golf course, so everywhere you look you see luscious green areas, mature trees and a natural vista that is quite breathtaking. The garden receives a lovely mix of sun and shade due to the natural cover from the trees. In the height of summer you can enjoy the gorgeous pink flowers and scent from the climbing flora that adorn the archways in the garden. Through one of these archways you will discover another part of the garden, there are more sun loungers here, and plenty of picnic opportunities to be found and a lovely coal BBQ gives you the chance to indulge in some grilling fun. 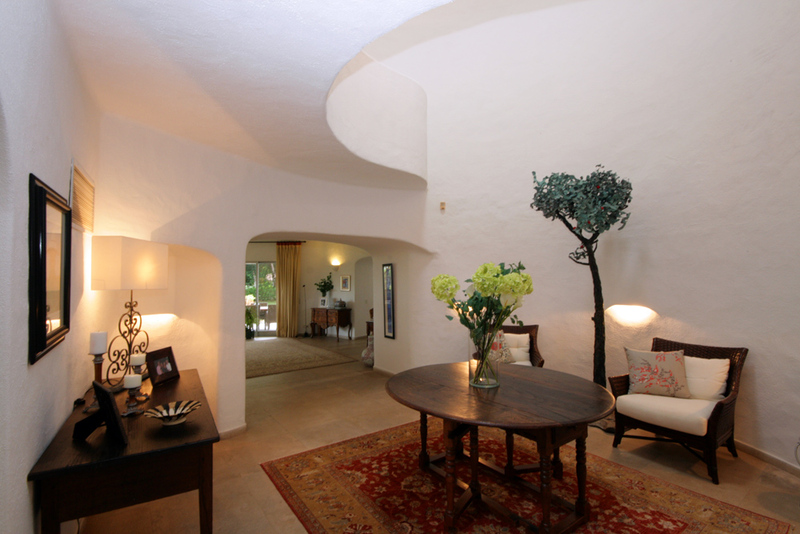 As you enter into the villa from the large curved wooden door you arrive in the impressive entrance hall. The double height ceiling with a domed sky light floods the area with natural light and you really begin to get a sense of the curvaceous nature of these rooms. The tiled floor is luxurious and in the centre of the room a red carpet makes provides a home for a feature table. There are many other design features placed in around the rooms - chairs and sideboards and artwork all help to compliment the spaces and colours of this wonderful areas. You can see archways leading into the rooms that are found off of this hallway. Straight ahead is the living room, and this room really is stunning in so many ways. The fantastically textured ceiling combined with the curved walls and an incredible fire place that protrudes seamlessly into the room from the wall, gives an almost cave like quality to this room - a very bright and luxurious cave. Comfortable sofas and chairs surround the fire place and a large coffee table in the centre of a rug really brings a sense of cosiness. A wall mounted flat screen TV with Satellite channels gives you the chance for movie nights or relaxing with family and friends, with such a peaceful and luxurious room you can't help but rest and enjoy your time here. 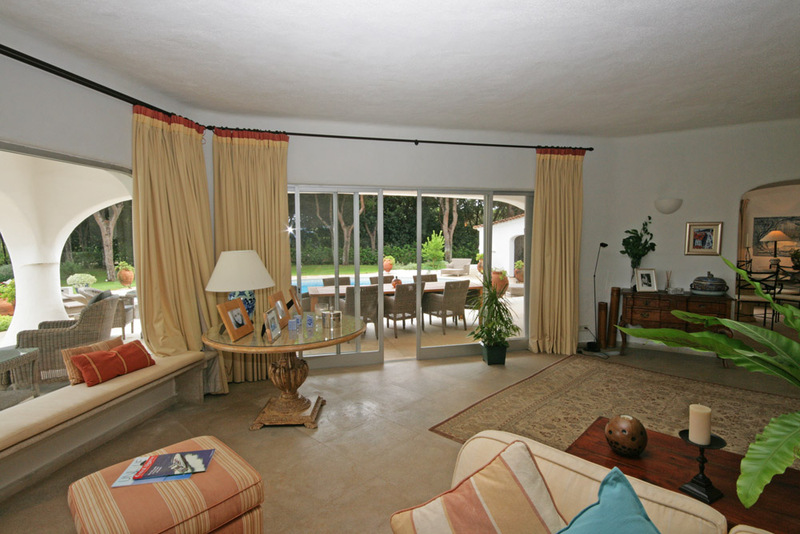 The patio doors run along the walls and open out onto the pool, garden and terraces. Through them you can appreciate the view into the garden through the curved walls, space-aged and cave-like all combined into one. The spaciousness of this living room is fantastic, plenty of room for large groups not to feel crowded. Another curved room is the dining room. This is a space ideal for indoor eating, relaxed yet elegant. The glass top dining table and black and white chairs offer a place to eat when you can't get outside or fancy somewhere different to relax over a meal with the other guests at this amazing villa. The art work on the walls and the finishing touches of vases on sideboards, really top off this room in style. Off of the dining room is the kitchen. 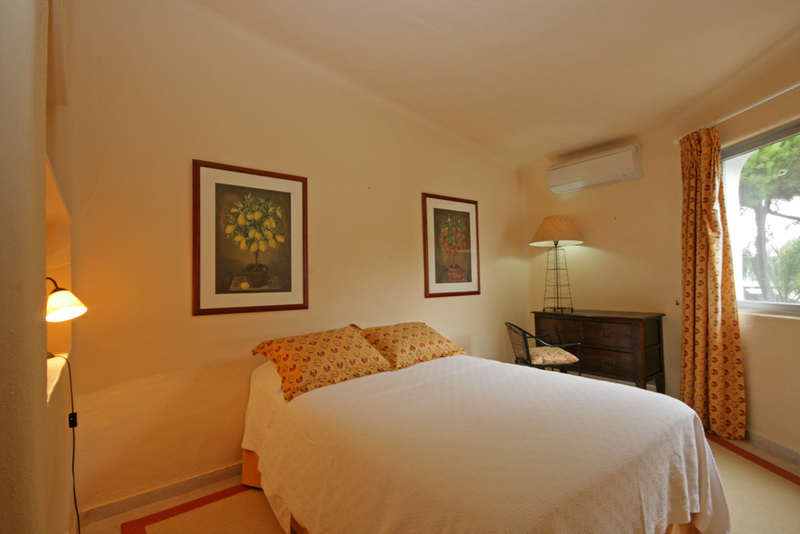 This well equipped room combines the necessary and the luxury very well. Beautiful brick style floor tiles combine with the breakfast bar, white cupboards and marble work surfaces, to provide an inviting area for your food preparation needs. 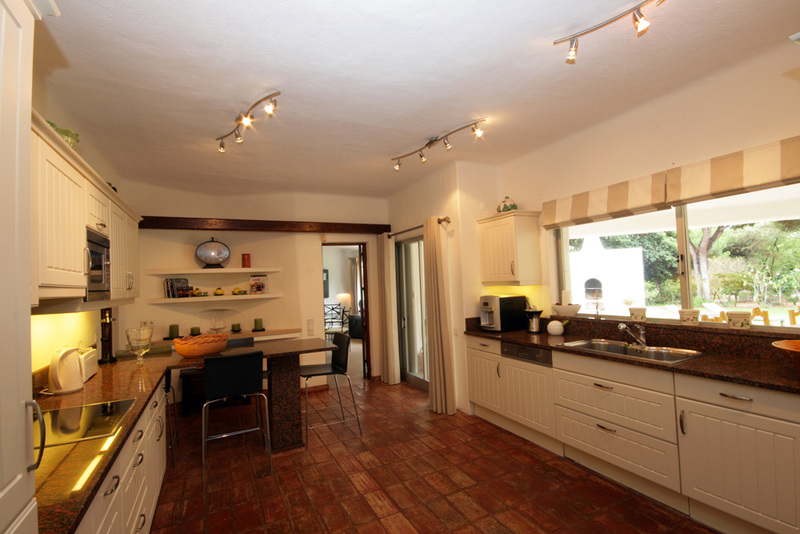 For your enjoyment and convenience there is a coffee machine, fridge freezer, dishwasher, cooker and hob and everything else you could want from a kitchen. There is a separate laundry room and a patio door gives you access to the garden from the kitchen. 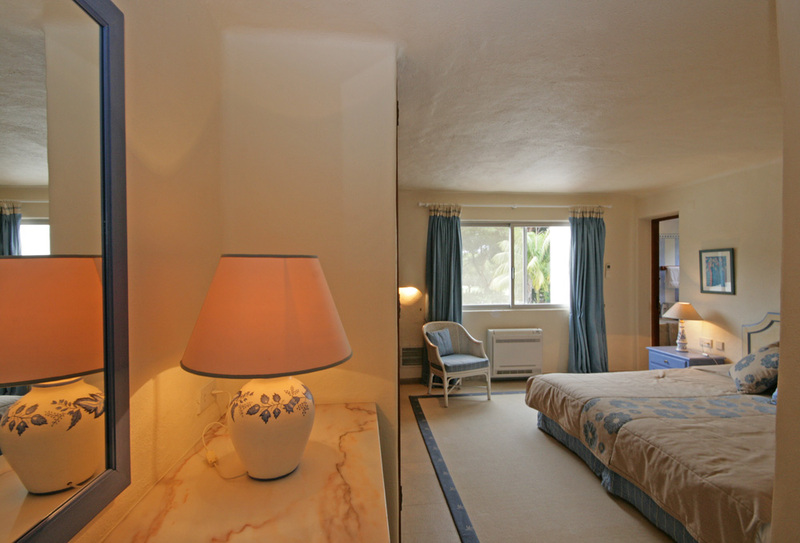 If all of this wasn't enough there is an annexe area that is found off the kitchen, and this room has a comfortable lounge area with a plasma screen TV, double bedroom and en-suite. 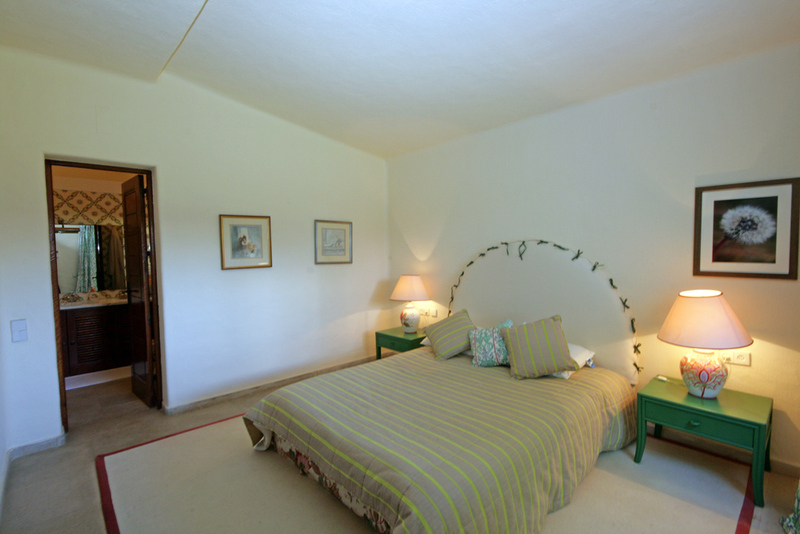 Two of the bedrooms are found on the ground floor, both are finished to an incredibly high standard, both are en suite with full bathrooms. Each room has its own style and feel and each room offers a place to unwind, sleep and rest that will leave you energised and ready to embrace the next day's adventures. 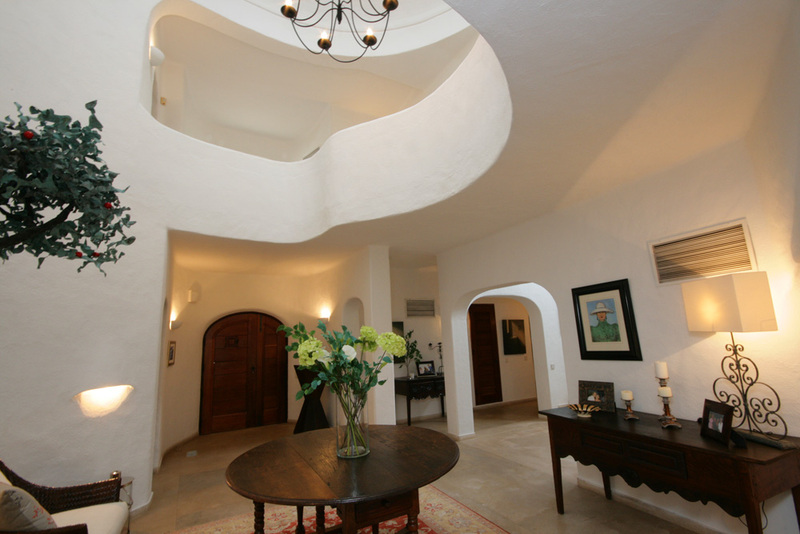 Head upwards onto the first floor and you will be delighted by the upper landing. This fantastic space offers the dome skylight above and the wonderful curves of the balcony looking down on the lobby area below. Arch windows allow you to gaze down onto the garden and the bright white walls that are present throughout the whole villa are continued here. 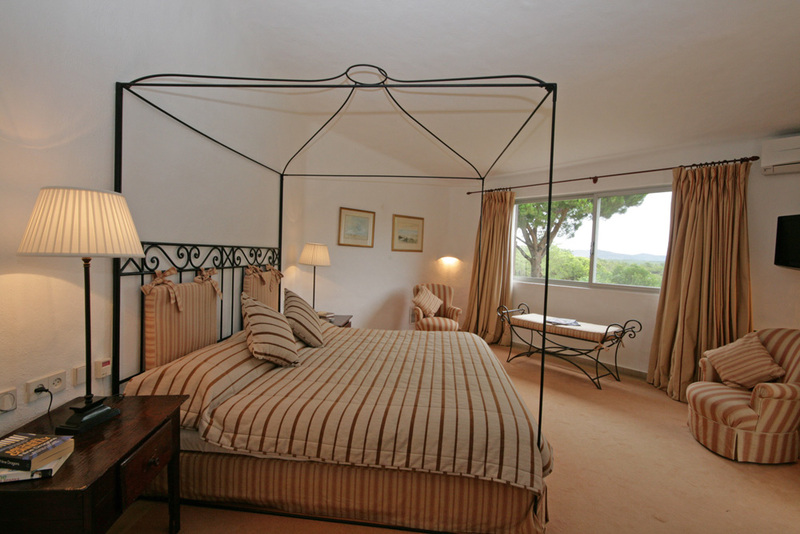 The master suite with its four poster frame and access to the private balcony just breathes luxury and style and offers a fantastic space for relaxing, sunbathing and siestas. 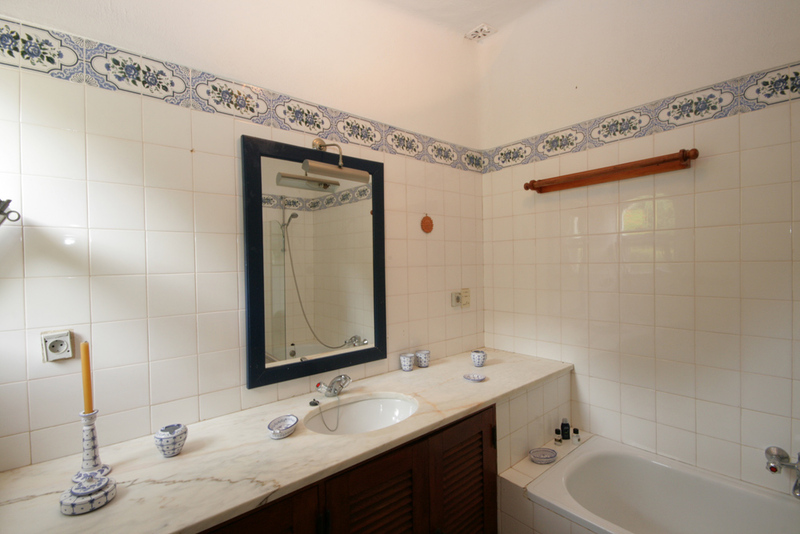 A walk in dressing room is also yours to enjoy if you are lucky enough to call the master suite your own for the duration of your stay, as is the beautiful bathroom with its TV - ideal for pampering and rejuvenating yourself. 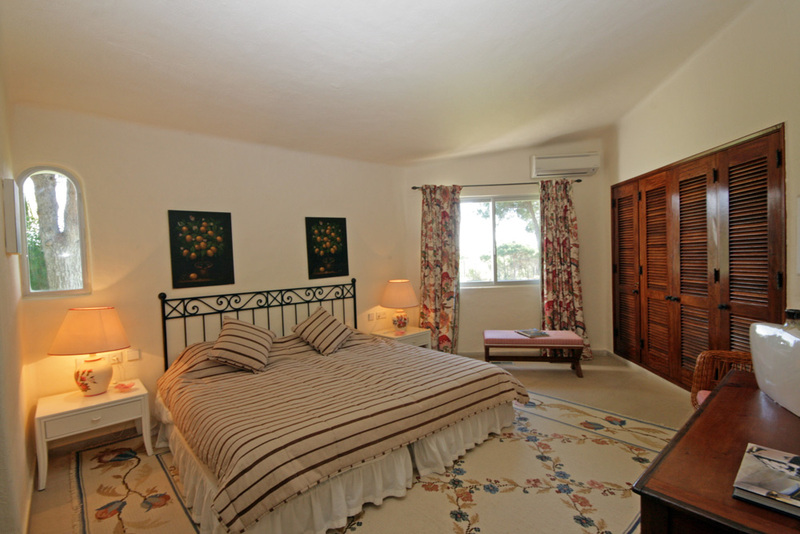 Two other bedrooms are located on this floor, both are doubles, one with an en-suite, and both are of equal quality and style, no expense has been spared to ensure this villa is in a class of its own. 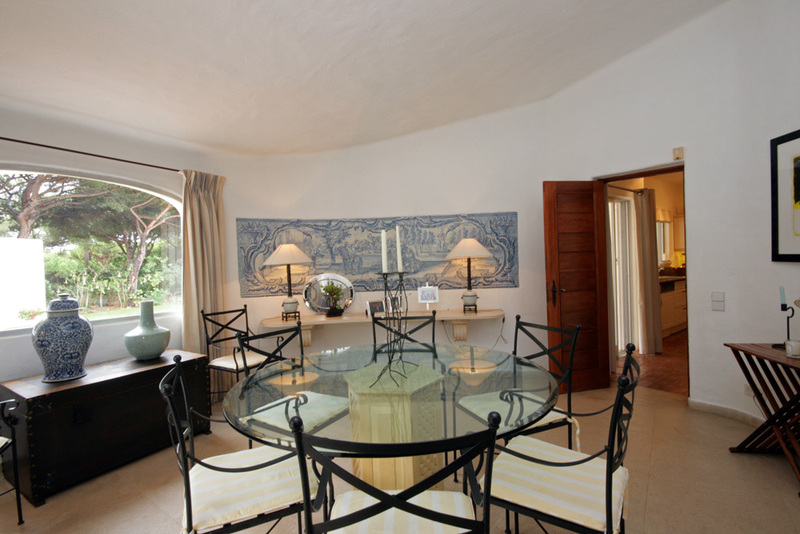 Golf is a big draw for anyone staying in this villa, as of course you are located right on the Quinta golf course. 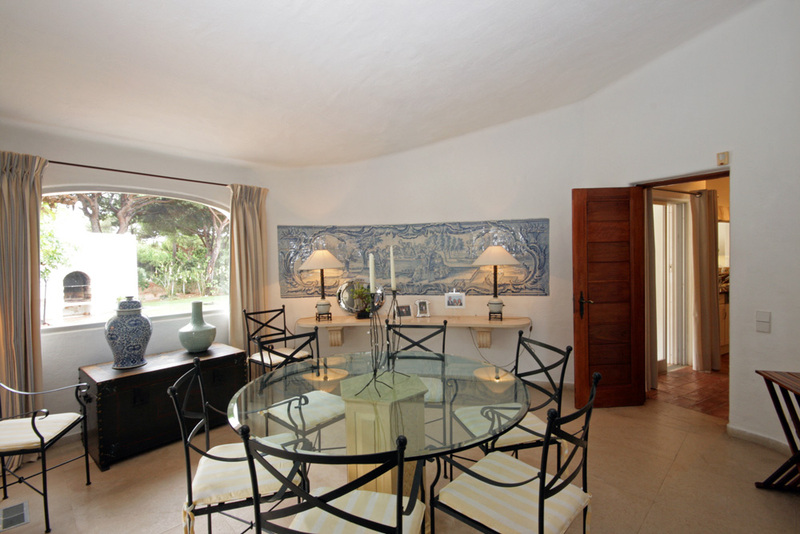 The Algarve does offer something for everyone, and staying in Quinta do Lago is no exception. Quinta has exceptional shopping, spectacular restaurants with fine dining, bars and entertainment catering for all tastes and ages. As well as golf, tennis and watersports also available readily here. You can read more about Quinta do Lago in our guide here. 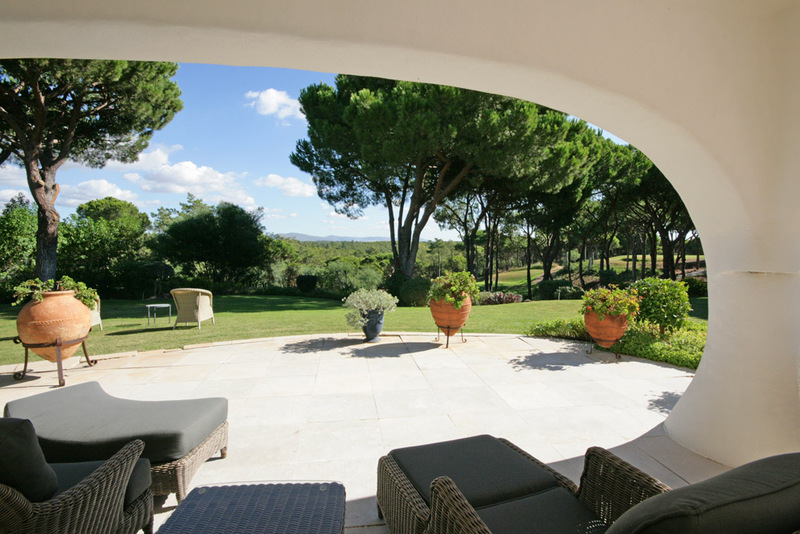 We highly recommend Quinta do Lago as a holiday destination and our team of advisors are happy to help guide and advise you to your perfect holiday home in the sun. Please note that there are building works taking place close to the villa.